WHEN, in 1937, the workmen engaged in making roads and sewers for the Council Estate at Broxtowe found Roman coins and pottery, it was at first assumed that this was the site of a large Roman military camp. Further research, however, proved it to be a British hut settlement, such as existed in all parts of Britain prior to the Roman conquest, in what is known as the "Early Iron Age" Culture. When Caesar invaded our country, he tells us in his "Commentaries" that "a town, among the Britain, is nothing more than a thick wood fortified with a ditch and rampart as a place of retreat against the incursions of their enemies." If we think of a village instead of a town, Caesar's description applies to our Broxtowe settlement. I think, however, that we have here a very important and unexpected discovery. As the large array of very highly finished and artistic Samian ware is examined, together with numbers of beautiful bronze fibulae, some silvered over, others inlaid with enamel, large bronze skillets, handles of vases and jugs, it would appear that the culture of these people was very similar to that of the inhabitants of the south, and that the previously accepted idea that the British of the Midlands were uncultivated barbarians in comparison with those of the South, is not correct. The site was triangular in shape. 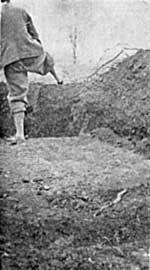 On the north there is a very steep valley, from the edge of which a ditch was made 14 feet wide at the surface, narrowing down to one or two feet at the bottom. The outer side was steep; "the inner side sloped more gradually in steps, and averaged about seven feet in depth. It ran in a southerly direction for a little over 200 yards, then it took a lather acute angle, and returned to the valley 300 yards east of its commencement. It enclosed an area of seven acres. The excavated soil was thrown inwards, forming a high bank upon which a palisade was erected. Many post holes were uncovered, and found to be five feet apart. These defences not only protected those within from enemies or wild beasts, but kept the cattle from straying when they were impounded in the central portion for the night. The site was well chosen for a settlement, the ground being level and 280 feet O.D., consisting of the Permian magnesium limestone, with 12 to 20 inches of soil on the surface. Below this comes The limestone rock, at first in thin layers, then massive; under this the Permian marl slates which crop out in the valley on the north, and coal measure rocks with thin seams of coal. The grey marls provided clay for furnaces and hut floors; outcropping bands of coal furnished the inhabitants with fuel. At the foot of the valley numerous springs of good water occur. The huts, of which about 20 have been discovered (from the remains of their floors) were usually rectangular, ranging around 18 feet long by 8 feet wide. A few appear to have been circular. One hut, which may have been used as a workshop, was as large as two of the others. It contained remains of furnaces, hearths and much iron slag. The hearths were made of neatly laid quartzite boulders packed closely together, slightly depressed in the centre, and upon these were one to two inches of ash of coal or wood. Some of these hearths were overlaid by slabs of limestone and clay, as though they had been built over to form a furnace or covcred-in fire. We must surmise the hut walls to have been upright for about six feet, or most of the floor space would be useless. These abodes were made near to the embankment, and preponderated near the north side. No floors or articles of any note have been found outside the limits of the enclosure (shewn on the plan) which can be attributed to this settlement. Most of the floors were made of clay from the valley. In some cases this was overlaid with roughly laid pieces of the local limestone. The central portion of the site was almost barren of finds, leading one to believe that this was where the cattle were enclosed during the night. There was evidence that a considerable amount of smelting and metal work was engaged in, judging by the quantities of slag, of both iron and copper. It is unlikely that their rude furnaces could melt the iron from its ore, but as this was usually the kidney ore or hematite, which is very rich in iron, a certain amount of roasting and hammering would produce a very workable metal. Iron nails, large and small, were very abundant, also knives, spear heads, and other rudely-made articles, which they probably made to exchange for their other requirements, such as pottery or brooches. No moulds for these being found, and no two being alike, seems to imply that they were not made at Broxtowe. The remains of animals give an insight into their food supply. The bones of oxen, sheep, pigs, deer, and horse were to be found everywhere, especially those of the horse. This would suggest that horseflesh was a favourite food. Judging by the thousands of oyster shells scattered around the huts, these also must have been a very popular part of their diet. The complete skull and neek of a horse was found just beneath the floor of the largest hut, as though it had been buried for some occult purpose. The breeding and rearing of cattle must have been one of their chief occupations. Querns for grinding corn, sickles for reaping, and portions of other agricultural implements point to corn growing, for which the land is admirably suited. The objects found at Broxtowe by the Thoroton Excavating Section are placed in the Bastion of the Nottingham Castle Museum. Whatever was found by myself prior to August, 1938, is also there. When the museum was closed in September, 1938, it was suggested that some of my finds should be placed in the Margidunum Museum of the University College at Highfields, two cases being placed at my disposal. Everything discovered since by myself is there on loan. The coins found are very numerous, though nothing in the nature of a hoard was discovered. They occurred singly all over the place, and were usually of the second bronze type of Roman coinage, ranging from the reign of Augustus to that of Vespasian. Three silver legionary denari of Mark Antony were found, but as those coins were usually made of debased metal, they remained in circulation for two centuries or more, it not being profitable to melt them down. A second brass coin of Agrippa (Neptune typo) is one struck during the reign of Augustus. Antonia, the mother of Germanicus, is represented by two coins struck during the reign of Tiberius. None of Caligula has been found, but there were many of the coins of Claudius 41-54 A.D. The coins of Nero, 54-68 A.D., were also numerous, one being of a rare mintage, having the usual head of Nero on the obverse, but the reverse showing a fine edifice with the words MAC AVG. This wa.s the Maecllum or Market Place at Rome lavishly built by Nero. The coin was struck to commemorate this event. A very rare coin, it was found at Broxtowe in very good state. Vespasian 69-77 A.D. is represented by two coins, struck 71 A.D., and these bring the coin record to a close. Though two or three small ones of rude type were found belonging to the 3rd century, they are of the class which may be expected to turn up anywhere.